October 13, 2016 — So…this is just one of those articles where I make a bunch of Tim Burton references, right? Easy as meat pie. The Beetle House is a Tim Burton-themed bar that just opened a few months back at 308 E 6th Street in the East Village of Manhattan. 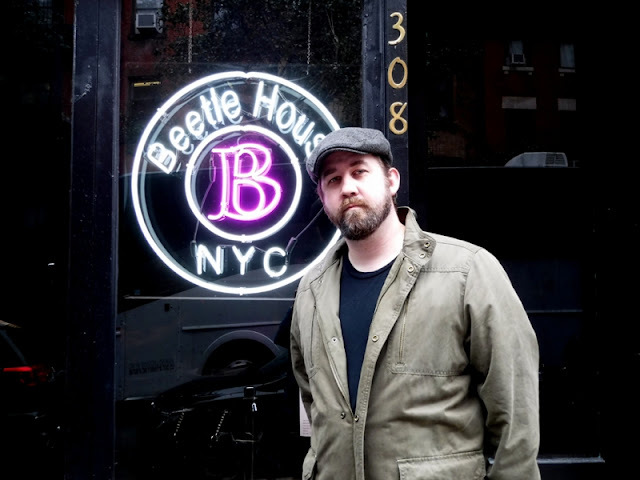 When we found ourselves recently on a big adventure in that borough chasing down Psycho Houses and Washington Irving sites (counts as a Sleepy Hollow reference), we decided we wouldn’t break from all the oddities for lunch…we’d choose an oddity for lunch. The place is reservation-only, but we got our slot online right away even though it was just the night[mare] before. Outside a dark window and a black banner were both adorned with the purple B that is the restaurant’s logo. B as in Batman, as in Beetlejuice, as in Big Eyes, as in Big Fish, as in Batman Returns. I stuck my head inside suspiciously like Jack Skellington at the Christmas door. Peering deep into its Johnny Deppths, I saw purple glows and black and white stripes. Plenty of Dark Shadows. And the reservation-only policy made instant sense. It was a tiny place. Like Oompa-Loompa-sized. A long thin hallway was half taken up lengthwise by a bar, which ended in a scattering of tables seating less than two dozen people really close together. 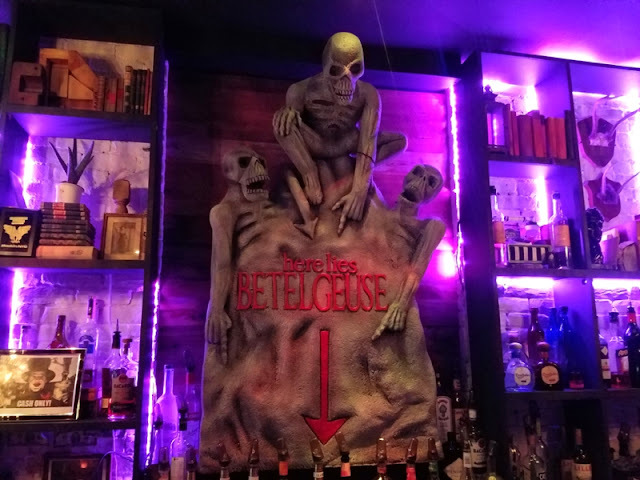 A large Styrofoam Burtonesque sculpture dangled from the ceiling, and art inspired by Burton’s movies lined the wall opposite the bar, behind which was a giant version of Beetlejuice’s headstone. I timed our 1 pm reservation badly. First, my reservation was stuck between two different parties of ten, causing a bit of a wait and some confusion over seating. I don’t know if this was because Miss Peregrine’s Home for Peculiar Children had premiered the night before or what. Second, they apparently serve brunch on Saturdays during the day instead of the regular menu. Which is a whatever. Third, though, the bar doesn’t open until 4 pm or so. That latter was the biggest bummer as every advert I’d seen from them advertised their cocktails. Also, I’m an alcoholic. 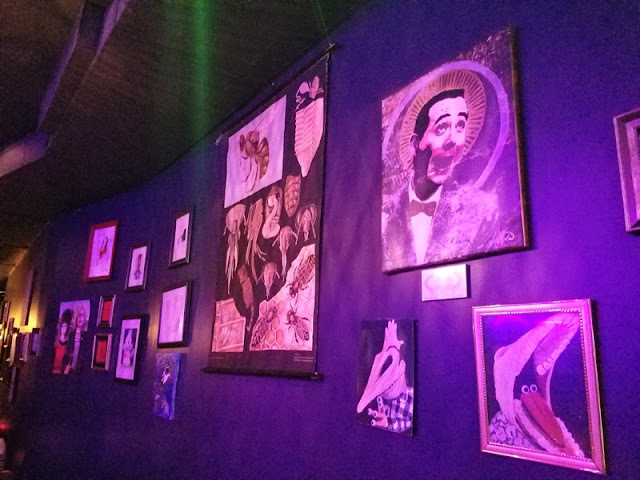 According to the brunch menu, the place also featured costumed characters, which weren’t there for us, so we missed out on being attacked by Martians or served by cabin boys or charmed by Vincent Price. The blood-stained menu only sporadically made apathetic Burton puns: Edward Burger Hands, Sweeney Steak and Eggs, Eggs Skellington. Out of more than a dozen items, that was it. A quick check of their dinner menu online revealed the same. 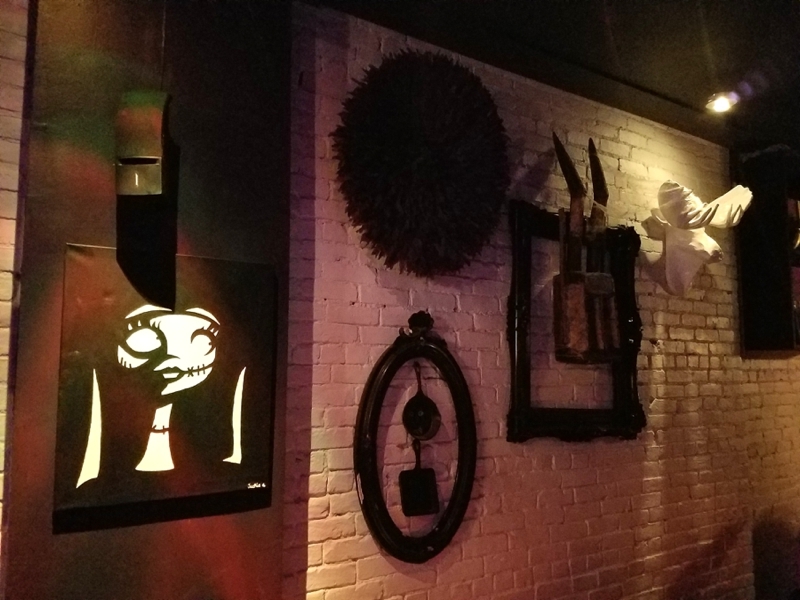 Were it up to me, I’d expect a Melancholy Death of Oyster Bar, Ed Wood-Fired Big Fish, or Grilled Frankenweenie, followed by a Big Eye-Scream Sundae with a Plantain of the Apes and Charlie and the Chocolate Sauce. James and the Giant Peach Cobbler. I found the drink menu online. Here, the references were plentiful, if mostly ill-used. The Beetles Juice was a single letter away from working. Alice’s Cup o’ Tea works…although it would’ve been better as Alice’s Cup o’ Long Island Iced Tea. Big Fish Bowl seems right. Barnabas Collins, too. They should have also had a Corpse Bride Reviver and a Beetlejuice, Beetlejuice, Beetlejuice…which would be an interactive drink where the barkeep must place their hand over your mouth before you finish the third Beetlejuice, else your drink is free…and poisoned. Overall, I’d call it lightly Tim Burton-themed, which is also how'd I'd describe most of his recent movies. Just enough to not risk a lawsuit (they disclaim their lack of a connection to the director all over their website). 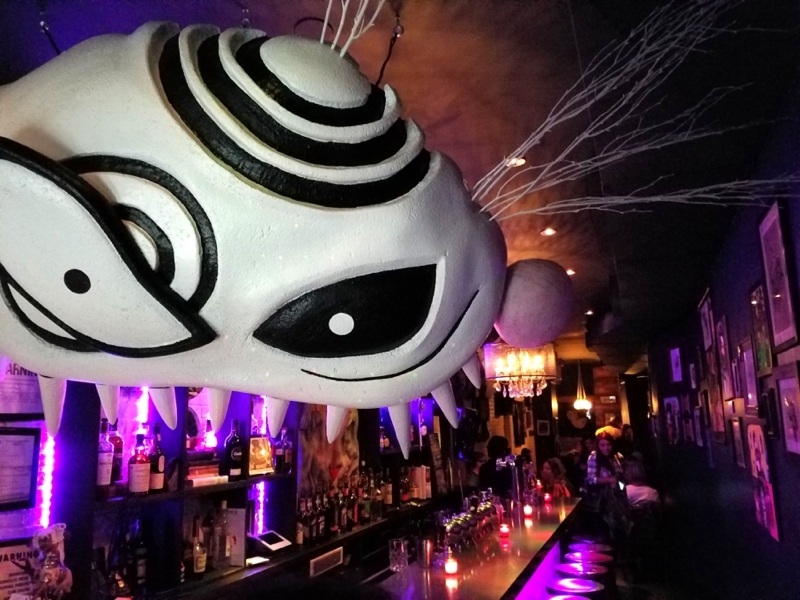 The fun part about dining there in my experience, was overhearing everybody talking about Tim Burton movies. I mean nobody ordered shrimp cocktails and broke into Henry Belafonte, but the director was the topic of most of the conversations I overheard in our close quarters. And that’s what the place is for. You don’t care about the food. You only care about the drinks if you aren’t getting any. You go there for the gimmick, and complain about how unique Tim Burton used to be before he just started interpreting everybody else’s visions. In conclusion, Abraham Lincoln: Vampire Hunter.